Last week I posted some previews from my grownup coloring book, Introvert Dreams. I’m excited to say that early this morning the book was officially released and is now “live” on Amazon! If you like, you can grab your copy here. Introvert Dreams features 90 pages of artwork and a storyline based on our own dreams as introverts. The story follows a woman and her cat as they wander through the vast, quiet landscapes of her inner dream world. Along the way they will find forgotten places, search for a wish-granting star, and ultimately find themselves in a loud, crowded city—somewhere she knows she won’t fit in. As introverts ourselves, Jenn and I find that we often feel alone or misunderstood. We wanted to make this book because we want introverts to see themselves in the story. Many of the scenes are taken straight from our life experiences, like being in the middle of a raging party that everyone else thinks is fun, but only wanting to cover our ears. Other scenes just represent that beautiful, imaginary, quiet place that I think all introverts retreat to when they have time to close their eyes and dream. This is our first coloring book, although we are both experienced authors. We brought on a talented illustrator, Maxeem Konrardy (also an introvert), who has created a whimsical, breathtaking world. We also paid attention to what colorers told us they want in a book: the images stop just short of the edge of the page, so you’re not trying to color into the binding, and none of the big scenes are printed back-to-back, so you don’t lose one when your pens bleed through from the other. We want it to be a book you really cherish and enjoy revisiting for years. If you’re an introvert, or just someone who loves occasional alone time, this book’s for you. We hope you enjoy coloring it as much as we enjoyed making it. I also have some good news: Amazon is currently discounting the book. Jenn and I have no control over this, and I would assume it’s temporary, but for a limited time you can snag your copy for over $4 off. It’s been a while. In the past year, I’ve branched out substantially in what kind of writing I do—including writing about being an introvert. I’ve known for years that I tend to prefer alone time to time with people; small groups to big parties; and quiet weekends where I can do lots of creative work. But it’s only recently that I’ve understood what it means to be an introvert, and the strengths that go along with this often-misunderstood trait. That’s why I’m particularly proud of a coloring book I created with Jenn Granneman, the founder of Introvert, Dear. Jenn and I were at a holiday party last year talking about the adult coloring book craze (Jenn loves to color to relax). Someone jokingly suggested that there should be a coloring book made just for introverts. We started to laugh, and then realized: yes, yes there should be. So we got to work. We reached out to several introvert artists and ended up asking Maxeem Konrardy to be our illustrator. Max and I storyboarded the book together and he brought our crazy ideas to life. Now I’m excited to say we have a finished coloring book that is, we believe, the first one ever made truly for introverts. We call it Introvert Dreams. Introvert Dreams tells the story of an introvert who slips through the pages of a magic book. With her cat at her side, she travels through a beautiful inner dreamworld, seeking a seven-pointed star that’s said to grant wishes. But the star is hidden away in the midst of a giant, crowded city—and when she finally reaches its hiding place, she’ll find much more than she expected. For Jenn and me, Introvert Dreams represents 11 months of work. It’s been a wild ride learning how to collaborate with artists, create a visual story and make a coloring book idea like this into reality. And I’m happy to say it’s finally ready. Introvert Dreams is now available for preorder on Amazon.com. Preorders get a special discounted price of US $12.99 instead of the usual $14.99. Click here to order your copy now. Jessica was heading to New York, leaving me the keys to her house and car. I planned to do a vanishing act and get back on the road before she returned. But that left me almost a week alone at her place: a week to hermit up and write. New Orleans holds an infamous number of distractions, plus good friends I haven’t seen in months. The idea that I would be locked at my laptop morning, noon and noche was a little hard to believe. But it was a chance to recharge my secret introvert nature. During our Caribbean trip Jess and I had been together almost 24/7 and we were “on” all the time, straining our intermediate Spanish any time we left our room. Then our return flight landed us right in the middle of my birthday celebration. I needed solitude. And a chance to just write. So my days have taken on a delicious monotony. I wake up and start writing immediately. I make coffee, I offer to the lwa, and then I go back to the computer. Once I’ve finished at least one project I eat a breakfast of granola and yogurt, and I usually listen to philosophy podcasts or read my twitter while I eat. I might do yoga. In the afternoon it’s more of the same: I write. Or edit, design, or otherwise create. I’d do this everyday if I could. By 3 o’clock I do need a break. I go out and walk, either to the grocery store to get a fresh salad, or just around the neighborhood. Often, when I come back it’s time for some lighter lifting: still working, but on things that don’t take much concentration. These idyllic days aren’t sustainable. I do have to work on, you know, paying stuff—stuff that keeps me fed. But this week of free lodging happened to line up with a week where I could get all my client work done right at the beginning, and reserve the rest of my time for me: my readers, my hopes, my writing. It’s like a mini-sabbatical. Night brings more productive time. I try to do things that don’t require the screen, since my eyes get tired eventually. I might go for another walk and chat with a friend on the phone. Otherwise, I have no meaningful human contact all day. My whiteboard. Thank You Eyeball not by me. 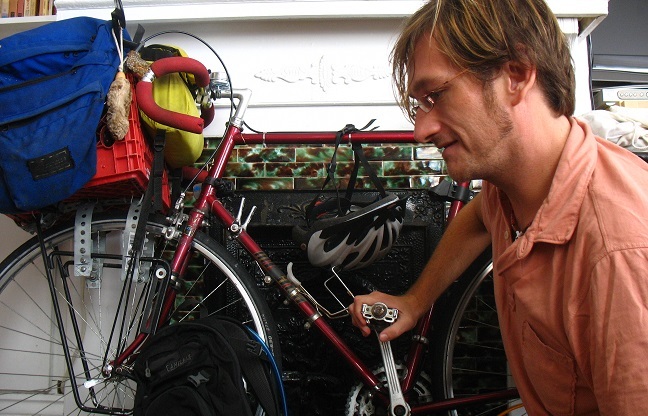 For someone who adventures as aggressively as I do, this sedentary and oddly private life might seem like a paradox. But while adventure has required me to develop social skills, I suspect I always will be an introvert at heart. I delight in time with my friends, but it takes effort and eventually I run dry. To be sure, my capacity for social time—my introvert “battery,” if you will—has grown. An hour at a crowded event, a conversation with a stranger, a day-long outing with friends: none of these is nearly as draining as it once was, and a life of embracing the unexpected has give me tremendous adaptability. To the introverts out there, yes, you can strengthen your people muscle, and it feels good to be strong. Yet my love of quiet time is magnified by the art of adventure itself. Adventure requires living reactively; it requires constantly re-adjusting to unexpected surprises and difficulties. For any adventurer, finding an interlude of simple, unbroken peace and quiet takes on a special significance. It becomes a sanctuary. We see this in the Odyssey and we see it in hitchhikers and explorers today. So I often find myself bouncing between adventure and creative solitude. Even in the Dominican Republic I insisted that Jess and I have at least two “adventure days” a week, whether that be renting a motorbike or just hiking to a remote beach (that we never reached). It’s a mix I’ve come to savor. And it’s done its job. While I still have doubts, I find myself much more excited now about the next leg of the Adventure than I was a week ago. I can’t say for sure that I’ll live in Corpus Christi for months—not when I could just blow right past it and go straight to Mexico. But I do know that the prospect of the next three weeks of roadside camping, limited wi-fi and relying on strangers is starting to look less like a self-imposed prison sentence and more like, well, an adventure. Wherever my next long-term stay may be, my eternal hope is to find a living situation that offers both types of fuel: three days a week to strictly cloister myself to write, meditate and rejuvenate; and the other days to wildly explore, celebrate with friends, and enjoy the world. It’s a balance I’ve never quite struck. 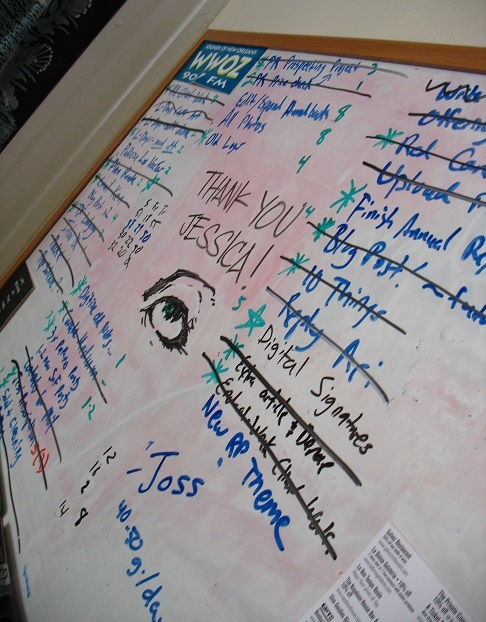 The day Jess left I filled up her whiteboard with a to-do list of all my projects. It had 37 items. “Do you think you can finish them all?” she asked. I guess I feel that way about a lot of things.